Let's open the MDPC valves for new products and colors in 2017. Here we go with our latest color creation, the purest orange shade within the spectrum: Papaya-Orange! Highly UV-reactive and of course the peak of today's cable sleeving manufacturing from base-material creation to final production, 100% made in Germany. Papaya-Orange is now available to all of you! 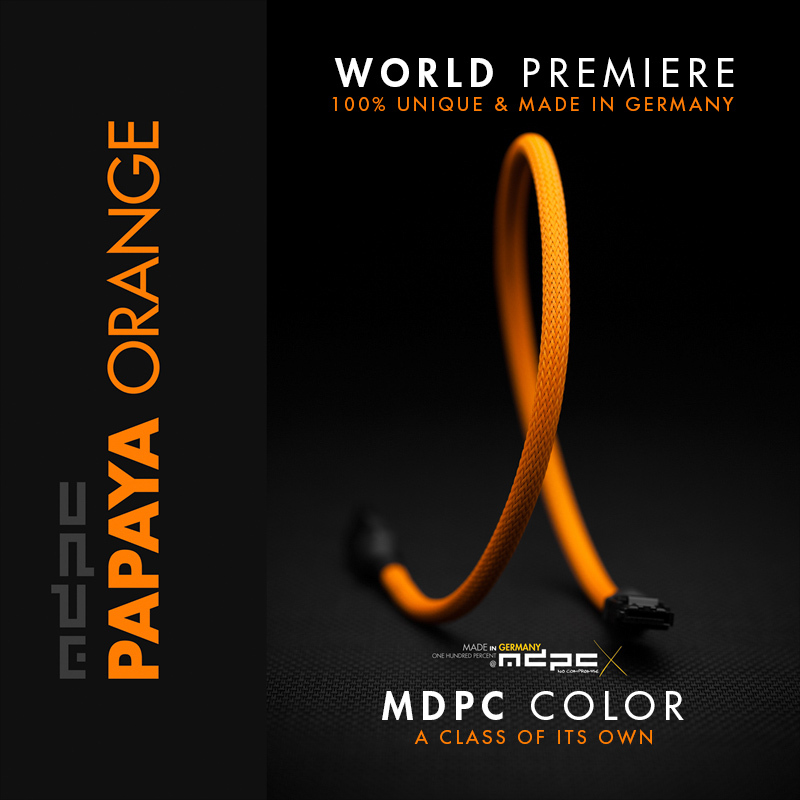 MDPC-X Papaya-Orange is the pure orange shade within our color spectrum. In the sports car industry it is the typical choice when it comes to orange paint jobs. In the computer industry it is well known from the highly recommended BeQuiet(TM) products. With our new offering, we will further push the possibilities of your designs, when it comes to a perfect orange shade. 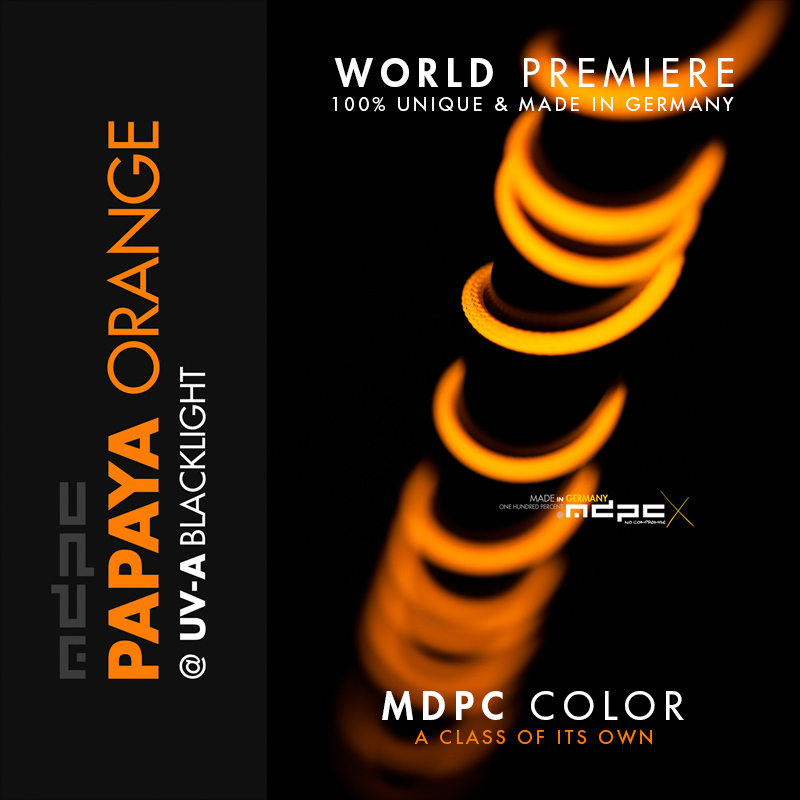 The high UV-reactivity properties of MDPC-X Papaya-Orange cable sleeve, make it pop under natural daylight influence and truly glow under UV-A blacklight. Purest orange in every environment is guranteed. With our uncompromising color creation and fabrication technology, you can be assured to have the best possible orange cable sleeving in your hands and as an essential part of your project. No color or material degredation over time, no manufacturing flaws out of the box: As always, a class of its own! 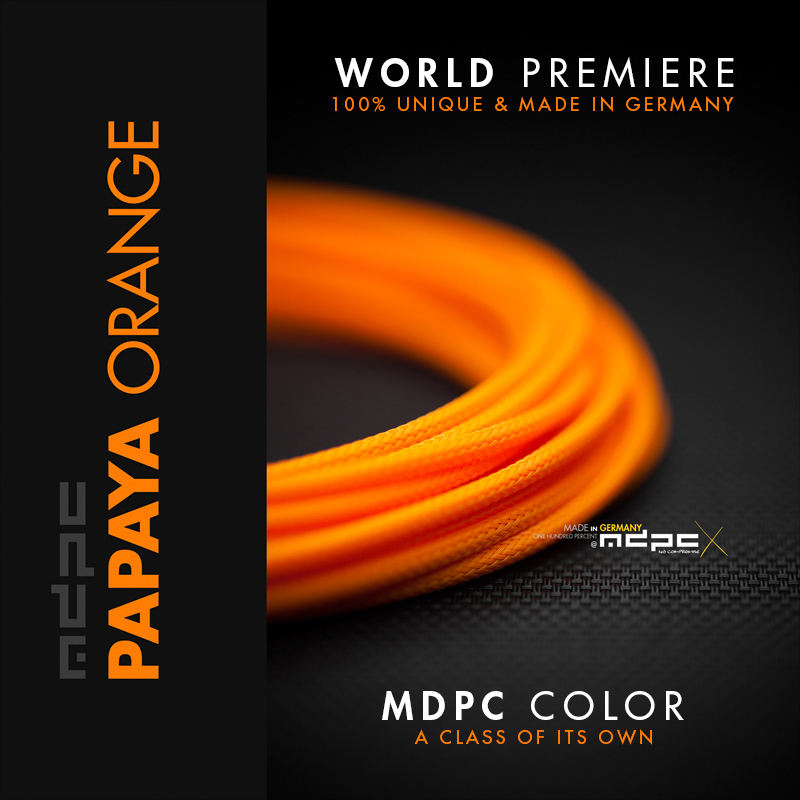 Get the new Papaya-Orange cable sleeving by MDPC-X now! You can order Papaya-Orange directly from us and of course you can also get MDPC-X Cable Sleeving products in even smaller quantities and directly in your continent / country through our global MDPC-X Stores. Papaya-Orange is available as SMALL cable sleeving and as MEDIUM cable sleeves.